After six intense days of racing at the 2017 Blind Sailing World Championship culminated by having the best blind sailors in the world show off their skills. Each day presented the sailors with different conditions, but in the end 52 races were sailed by the 51 sailors. “When you combine the high quality sailboats, provided by SEAS, with very competitive individuals, once again it was proven that a visual impairment does not define these sailors. The sailors defined their individuality when the best sailors, who happen to be blind, were presented gold for their respective countries”, said BJ Blahnik, event coordinator. Each team is comprised of four sailors: A visually impaired helm and main trimmer along with a sighted tactician and jib trimmer. The three divisions are defined by the level of visual impairment of the sailors: B1 division has a totally blind helm and totally or mostly blind main trimmer; B2 division has a mostly blind helm and main trimmer; and the B3 division has partially blind helm and main trimmer. The Championship was originally going to be held in Houston, TX, but they had to cancel in March not knowing their foresight of Hurricane Harvey. “Without the determination and tenacity of the organizing team, this event would have been lost and the Blind sailing teams twelve months of hard training and aspirations would have been unfulfilled. Instead of disappointment and a lost opportunity, we have seen hard fought battles, close competitions and achievement” said Vicki Sheen, Chairman Blind Sailing International. The very strong squad from GBR came out on top in the Squadron Cup with wins in the B2 and B3 divisions and a close runner-up position in the B1 division to clinch the trophy for the top team. Lucy Hodges (GBR) and her team, Toby Davey on main, Ben Hazeldine as tactician and Colin Midgley on jib, were more than convincing in their victory in the B2 division with a flawless scoreline of only 1st place finishes. The podium positions in the B1 division were up in the air until the final day of racing with a tie at the top and another for the bronze. When the B1 division come on the water in the afternoon for their final three races, the racing was intense. Some aggressive starts were seen with match racing tactics on display as the tied teams pushed each other around maneuvering for controlling positions. 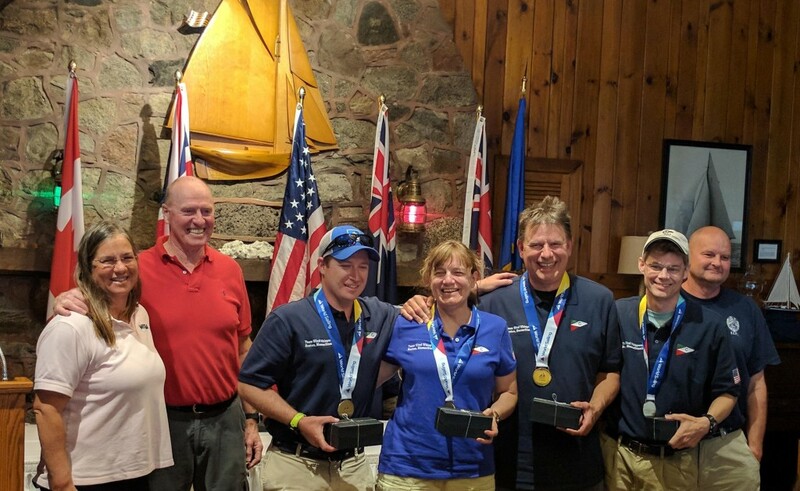 Duane Farrar (USA) and his Team Wind Whisperers including Amy Bower on main, tactician Denis Bell and Andrew Alletag as trimmer, won the day with a first, third and second in the final races and net score of 31 to secure the gold medal for the second time. The battle for the top of the B3 division was an intra-squad fight between the two British B3 teams skippered by Laura Cammidge and Mark Austen. Sail Sheboygan is the US Sailing Center of Sheboygan to develop abilities in sailing and seamanship in individuals to the extent of their capacity. We believe that regardless of age, income, ability, or disability those who come to understand the fundamentals of sail trim, teamwork, and seamanship understand more about themselves, their fellows, and their world. SEAS strives to educate the public about the benefits of sailing and boating, preservation of our maritime heritage and serves as a resource to help support the organizations, clubs, and individuals that fit the parameters of our mission, Boating for Everyone.